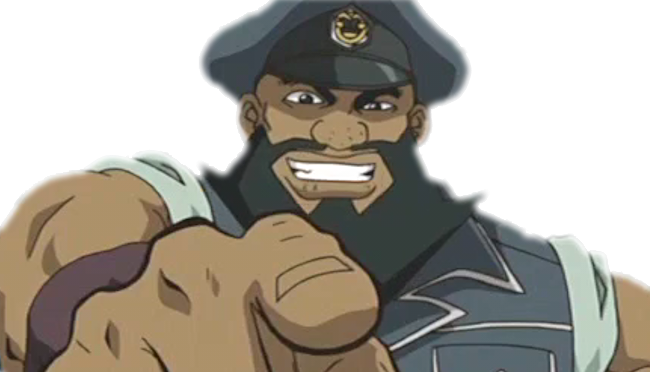 Mr. Armstrong is the warden of the Detention Center that Yusei is being held at after his and Jack’s duel in the Stadium. Armstrong uses his power as Warden to mistreat and abuse the detainees. After Yusei challenged and defeated Armstrong to win the freedom of all detainees after Armstrong locked down the entire facility, Rex Goodwin, who watched the duel from above, fires Armstrong. 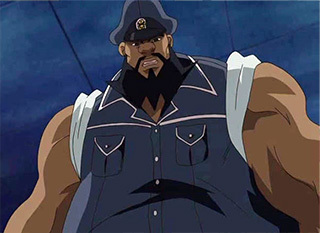 Armstrong uses a “Chain Deck”, focusing on his “Chain” monsters, as well as deck destruction and effect-damage tactics. His Ace Monster is the Synchro Monster “Iron Chain Dragon”. Rex Goodwin tells him to investigate Yusei Fudo. Armstrong complies and beats up Yusei’s friends Bolt Tanner and Yanagi and has Yusei transferred to a different room. Yusei later duels Armstrong, with Yusei’s freedom on the line. Armstrong has seized all of Yusei’s decks so Yusei duels him using cards given to him by his friends at the Facility. Armstrong conducts the duel in an arena where a player gets shocked when they take damage, but rigs the field to negate the shock transferred to him. In addition, he has his henchmen watching Yusei’s hand with security cameras. Alex discovers Armstrong’s cheating and shuts it down, and Armstrong loses the duel and is shocked into unconsciousness. Upon waking up, he tries to put Yusei back into lockdown, but discovers that Goodwin was watching the duel, and Armstrong is thrown out of his employer’s good graces. However, in the dubbed version, he is fired for not having trust between his inmates. Armstrong plays an Iron Chain Deck, which focuses on mainly on milling the opponent’s Deck and inflicting Burn damage.